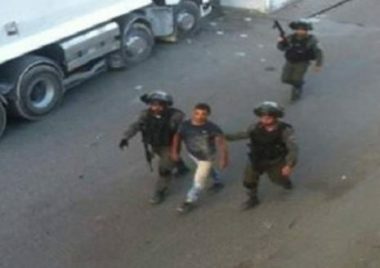 The Palestinian Prisoners’ Society (PPS) has reported that Israeli soldiers invaded, at dawn Wednesday, Qabatia town, south of Jenin, in addition to Qalqilia, Tulkarem and Jerusalem, in the West Bank, and abducted eight Palestinians, including a former political prisoner. The Jenin office of the PPS said many army jeeps invaded Qabatia town, searched and ransacked several homes, and abducted three young men. The abducted Palestinians have been identified as Homam Adnan Kamil, Bassel Kamil and Hamada Saba’na, all in their twenties. In addition, the Qalqilia office of the PPS said the soldiers invaded the city, and abducted Mahmoud Ghaleb Jo’eidi, 26, after breaking into his home and searching it. In Tulkarem, many soldiers invaded ‘Allar town and Shweika area, north of the city, and abducted a former political prisoner, identified as Fathi Sami ‘Asrawi, 35, from ‘Allar, and Adnan Amer Ayesh, from Shweika area, after the soldiers broke into their homes and searched them. Also, the soldiers abducted two young men, who remained unidentified until the time of this report, after stopping them at a military roadblock, northwest of occupied Jerusalem. The army claims that the two young men were trying to place an explosive charge near the gate of the Annexation Wall in that area. Furthermore, dozens of Israeli soldiers invaded the Deheishe refugee camp, south of the West Bank city of Nablus, abducted five young men and injured one. Also at dawn, the soldiers invaded the northern West Bank city of Nablus, and shot two young Palestinian men, after the army fired live rounds, rubber-coated steel bullets and gas bombs, at local youngsters, who hurled stones at their jeeps.